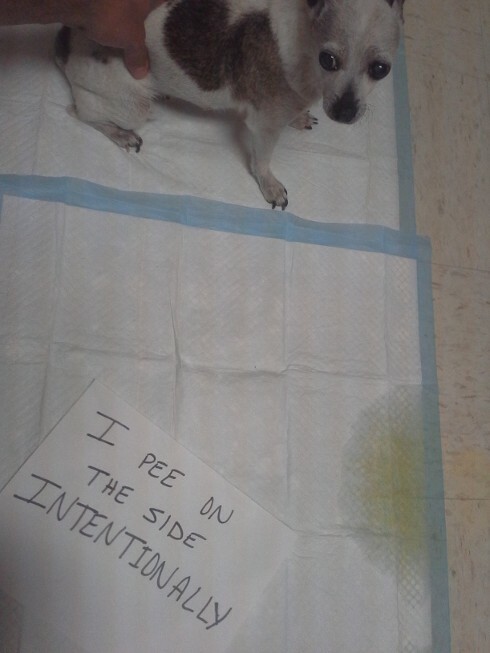 My 15 year old dog likes to pee on the side of a pee pad instead on in the middle….every time! Posted March 24th, 2014 . My mini dachshund Sophie does the same thing! It drives me crazy because it goes under the wee wee pad and then there’s a giant mess. If you think about how they pee their whole body is on the Pee Pad, They don’t know their backside is so close to the edge. alot of small dogs don’t like the feel of the pads on their feet, try covering the pad with some newspqper and see if that makes a difference. We use newspaper and it makes no different. As matter of fact, the carpet gets smear with the ink from our pets’ paws. Yup, lots of oxyclean and paper towel AND carpet steaming in one section of the house. My chihuahua does the same thing. Mine pee on SIDE of pee pee pad but CENTER of small rugs. Aaaawww! I love senior dogs! There’s a pee pad that is supposed to draw them to the center. He’s 15….he doesn’t feel obligated to follow some silly human rules. I was going to mention that too Grumpy. They’re called Bulls Eye Pee Pads. I’ve never tried them but have been curious whether or not they really work. You’re so lucky you have him at 15! But, I know you know that. Mine dig on the pee pad, turning it over then pee. At least your floor is linoleum which is easy to clean. Our 3.5 Poodle Maltese hand-stands then pees right on the edge of her newspaper “pee pad” every time. The rest of her piddle goes onto the polyethylene film which we use to cover her bathroom area to protect the carpet. Love how you have to pin him in place for the picture! You could try two pee pee pads, one absorbent side up and one right underneath it absorbent side down. It may work. He is so cute though. There’s a pee pad called “Bullseye” that is supposed to attract them to the center. I haven’t tried it yet. My chihuahua prefers the rug by the back door. Oddly enough she never pees on the edge of the rug, always dead center! Ugh! Well, my 14-year-old weiner dog does the same thing. I chalk it up to her just not knowing how long she really is. 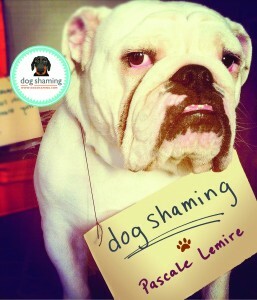 This also leads to her peeing on the sidewalk, while her front paws are on the grass! I guess she thinks that as long as *part of her is on the pad, it’s okay! Fixed everything. He’d pee on the inside pee pad until all the inside edges had been covered. There’s a pee pad holder with slightly elevated sides that guide the little dogs to stay on the pad. They’re available at Bed, Bath and Beyond or pet stores. The bullseye pads do not work – my dogs do the same thing and now my hardwood floors are showing damage from this! It’s infuriating! Petsmart and the vet sells a spray called ‘Adaptil’. I have sprayed a small amount on the centre of the pee pad and my dogs go in the middle. If I don’t they go on the edges.